Phyllis A. Blake, 95, of Merrill, passed away on Tuesday, March 19, 2019, while residing in Pine Crest Nursing Home, Merrill. Phyllis was born December 31, 1923 in Stratford, Iowa, daughter of the late Peter and Clarice (Swedlund) Christensen. She married Warren ‘Keith’ Blake on February 24, 1946 in Iowa. He preceded her in death on December 7, 1996. Phyllis was a stay at home mother, but was very active in the Merrill community. 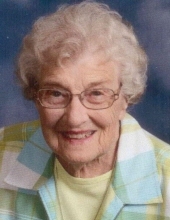 She was an active member of Christ United Methodist Church in Merrill. Phyllis assisted at local elections as a poll worker, volunteered her time at the Good Samaritan Health Center Gift Shop as a member of the hospital auxiliary, was a member of the Merrill Area Concert Association and chaired their membership drives, volunteered with the March of Dimes, served as a Girl Scout leader, and enjoyed the company of her friends at the ‘Study Club’ or playing Bridge. Phyllis was also a member of Beta Sigma Phi Sorority. Phyllis is survived by her daughter, Julie (Louis) Glassman, West Bend; her son, Richard Blake, Merrill; her daughter in law, Kathleen ‘Kathy’ Blake, Merrill; four grandchildren, Sarah Blake, Madison, Samuel (with wife, Tabitha Bennish) Blake, Rhinelander, Gail (Joe) Dettmann, West Bend, and Andrew (Amanda) Glassman, Elm Grove; three great grandchildren, Ruby, Miles, and Poppy; and a sister in law, LaVonne Christensen, Minnesota. Besides her parents and husband, Phyllis is preceded in death by two sons, Christopher and Peter Blake, and her brother Robert Christensen. The Funeral will begin at 11:00 AM on Monday, March 25, 2019 at the Taylor-Stine Funeral Home, Merrill. The Rev. Rich Vincent will officiate. Burial will be in Merrill Memorial Park. Visitation will be from 2:00 PM until 5:00 PM Sunday at the Taylor-Stine Funeral Home, Merrill, and again after 10:00 AM on Monday. Online condolences may be made at www.taylorstinefuneralhome.com. IN LIEU OF FLOWERS THE FAMILY REQUESTS MEMORIALS TO THE ALZHEIMERS ASSOCIATION. To send flowers or a remembrance gift to the family of Phyllis Ann Blake, please visit our Tribute Store. "Email Address" would like to share the life celebration of Phyllis Ann Blake. Click on the "link" to go to share a favorite memory or leave a condolence message for the family.